Wolf Lake is located just outside Apsley, it is about a 3 min drive from all amenities. 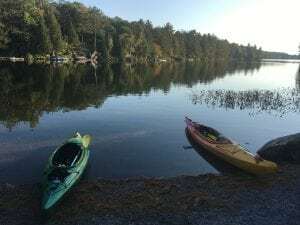 Taking Anstruther Lake Road, to wolf lake boat launch which is a public boat launch in Kawartha Highlands Provincial Park you can drop your boat and motor, canoe or kayak and start exploring. This lake will calm you, you can see right to the bottom on a sunny day in many spots and this is probably because it is not a very deep lake. You will even be able to see some of the fish species as they swim under your boat. Fish Species you can may find are large and smallmouth bass and even muskie. It is roughly 312 acres in size 24 feet deep at its max and 15 feet deep at average. My husband and I were kayaking this lake in August of 2017 (one of the many times) and we actually saw a Moose come down to the lake to take a drink after he drank he looked up saw us and took off up the hill crashing and thrashing in the bush. If you are up for a short portage you can go from Wolf Lake into Crab Lake at the south-west end of the lake.